Own an Android device? Wish you could get lyrics and other information for your favorite songs while you listen to them on your favorite streaming service? Genius’s Behind the Lyrics has the solution for you. Launched on iOS last year, Behind the Lyrics provides lyrics and interesting facts on songs, giving listeners a deeper look into the musician’s creative insights. Unfortunately, it hasn’t been available for Android users until now. Currently, Behind the Lyrics is only compatible with certain English songs. To see if a track is compatible, head over to the “Currently Playing” page. If the “Behind the Lyrics” banner appears above the album art, simply swipe down to view it. Behind the Lyrics may deepen the connection between the listener and the song, but if you want just lyrics, you’ll need an app such as SoundHound. Once you’ve linked your Spotify account through SoundHound, the lyrics for the particular song will auto-scroll along with the progression of the song. 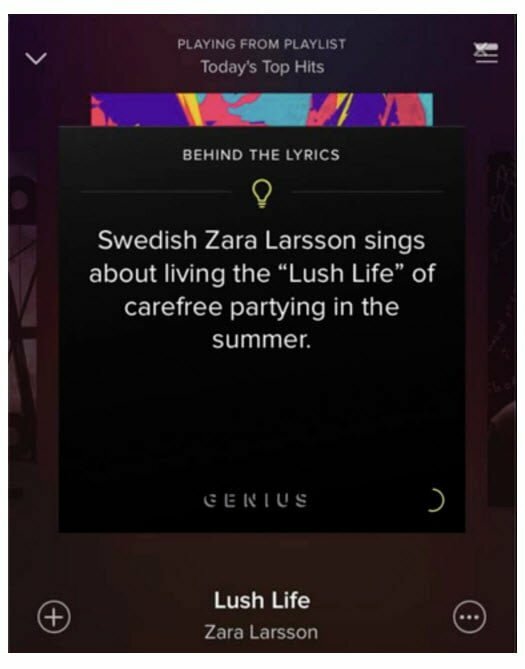 Spotify explains that it does have its own lyrics feature on the way, but it’s not ready to be released just yet.